Hell (6' by 8' unfinished- Acrylic on Canvas) is the first of my religious paintings although it's based mainly on concepts from Milton's Paradise Lost. 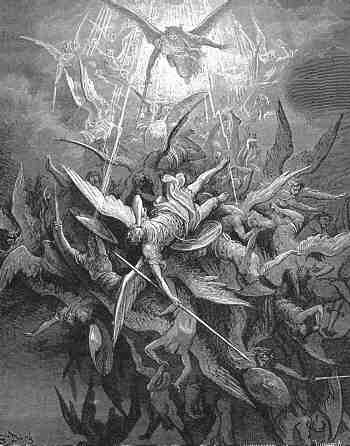 I've been a fan of Gustave Dore for years and his illusrations of Hell were one of the influences on this work. I even quoted some of Dore's characters. 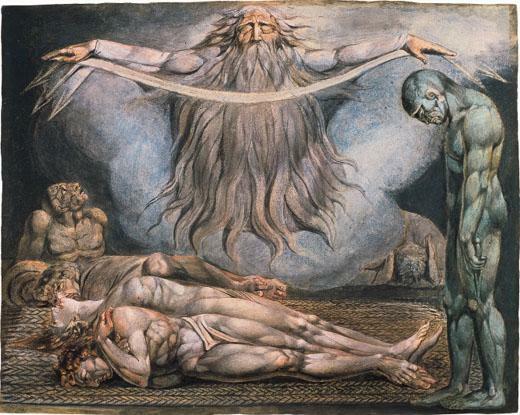 William Blake (1757 – 1827) has also been one of my influnces. He was an English poet, painter, and printmaker. During Blake's lifetime, and for many years afterwards, his work was largely disregarded or even derided as the work of a madman, whereas today his work is considered important in the history of both poetry and art of the Romantic Age. Blake is primitive in style. I consider my style to be primitive in some way. I'm not interested in painting every hair on the dog, I just want you to look at my painting and see a real dog. Your eye tends to fill in the blanks. So I decided to do a painting of Hell, another difficult topic. How would Blake do a painting of Hell? What have other artists done. Not much- Dore's illustrations came the closest to what I was searching for. At the same time I decided I would also do a companion painting Heaven, which I started several years later. First I decided I needed a giant canvas worthy of such a difficult subject. I bought some awning canvas and stapled a 6' by 8' sheet on some 2" by 4"s. I used Gesso to prepare the canvas, painting it on with a brush. I decided to use a cave- like setting with a river, like the river Styx. The inhabitants of Hell are driven insane, by snakes and other creatures. Those who are able must endure ardous labor, like the men forced to carry boulders on their backs for eternity. The focal scene is the judgement. The idea is we are all judged by our works on earth. In the center I am on my knees praying for forgiveness but all I'm going to receive is 40 lashes with a whip from the Devil. The moral of the story: Think about your works on earth and the consequences.